Built in the early 1990s, the Zambezi Queen was created to carry its guests on an extended journey from Katima Mulilo down the Chobe and Zambezi Rivers and back. 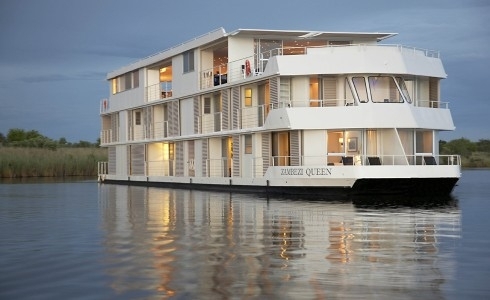 The sheer size of the vessel made navigating difficult and shortly after that, the Zambezi Queen ended up moored along the river bank where it acted as a floating hotel to visitors to the Caprivi Region of Namibia. Around 2008, two entrepreneurs saw the potential of restoring the boat to its former glory. A period of intensive re-designing and planning ensued. A third deck was added, giving the ZQ its imposing iconic look now famed worldwide. Located along the banks of the great Chobe River, the Zambezi Queen, affectionately known as the ZQ, offers world-class sophistication in one of the most remote locations on earth. With only 14 suites, the ZQ is as unique and adventurous as it is comfortable and elegant. In fact, it is unsurpassed in all aspects and the last word in Luxury African River Safaris. Each suite features air-conditioning and a private balcony, offering unobstructed views of the river and vistas. Enjoy remarkable game viewing from the comfort of your bedside.